Figure 1. The itchy papular rash on the patient’s hands and knees. The rest of the skin is normal. Figure 2a. Close up view of papules on the palms. Some lesions show a punctum. Figure 2b. Close up view of papules on thesoles. Some lesions show a punctum. 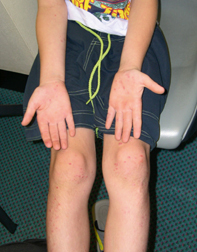 A 12-year-old boy presents with itchy papules on his palms, soles, elbows and knees. The lesions have been recurring for the last three years, appearing in spring and early summer and disappearing during autumn and winter. What is the differential diagnosis and management of the most likely cause? Several skin conditions should be considered in this case. Scabies has a broad spectrum of clinical presentations. Itchy papules and vesicles on the palms and soles should always prompt a search to exclude scabies. It also commonly affects the elbows and knees. Other signs that may be present include excoriations and nodules on the scrotum, axillae and areolae of the breasts. Typical burrows, diagnostic of this condition, are most easily found between the fingers. Scabies is not seasonal and other members of the family are usually itchy. The diagnosis is made by dermoscopy of a burrow or by microscopic examination of a scraping from a burrow. Psoriasis commonly involves the palms, soles and dorsal surfaces of the elbows and knees. It is not usually papular but it has a very wide clinical spectrum and should be excluded in this boy’s case. Psoriasis is not seasonal, but it often improves somewhat in summer due to sun exposure. Psoriasis is usually a clinical diagnosis made after eliciting a family history and finding other signs such as typical nail pits and other nail changes, scalp scale and periauricular rashes. Bindii (Jojo) dermatitis, which was first reported in 1982,1 is the correct diagnosis. This is an uncommon but distinctive eruption occurring in Australian children during spring and early summer, which is seen most often in boys who play sports such as football on grassed fields. Bindii dermatitis is characterised by discrete erythematous papules with puncta found on the palms, soles, elbows and knees. It is a hypersensitivity reaction that can be reproduced by pricking the skin with the spine of the Bindii seed. As it is relatively uncommon and resembles the two other common dermatoses described above, the diagnosis is often missed. Bindii (Soliva pterosperma) is a member of the Compositae family, which is responsible for many plant contact allergic conditions. Bindii dermatitis is a form of contact dermatitis, so the only effective management is to prevent contact with bindii. This can be easier said than done in a child who is dedicated to outdoor sports played on grass. Given that the football season in Australia is during autumn and winter, finding an alternative sport for the child during the Bindii season will often solve the problem. 1. Commens CA, Bartlett BH, McGeoch AH, Kossard S. Bindii (jo-jo) dermatitis the clinical and histopathological spectrum. Australas J Dermatol 1982; 23: 110-115.